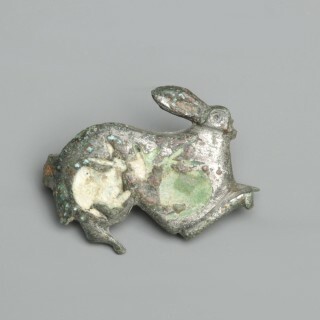 A finely detailed Ancient Roman tinned bronze brooch depicting a rabbit with young. The two young ones are represented by partly enamelled cells within the body, now a little worn. Reverse features the original pin and catchplate. 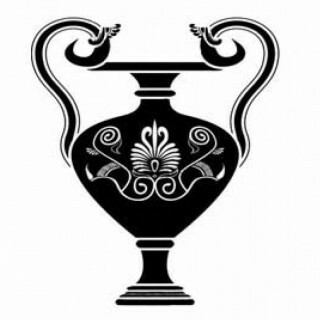 Brooches were a necessary accessory across the ancient world, being used to secure the garments of both men and women. A man would typically secure his dress or cloak using a pin, whilst a lady would more likely use a pin brooch. Brooches differ in their decoration and intricacy depending on the wealth of the original owner, and the period in which they were made. Some later brooches are made from silver or gold and clad with stones, whilst others are plainer and made from cast bronze. Brooches could also be enamelled to add colour and vibrancy to the wearer’s clothes.This specific brooch originated in France where, although uncommon, the majority seem to have originated. A few similar brooches have been found in Britain, but these are probably imports, especially bearing in mind that the rabbit was not known in Britain for another millenium.